You are amazing! Due to your overwhelming presence at the last Town Council meeting, the Library project has moved a step closer to fulfillment and that is a step further than any of the previous proposals have gone. One of the Town Council members who has served for many years, told me that there has NEVER been such a turnout for a project. Thank you all so very much for braving the crowd, the heat, and the inability to hear or sit – it proved without a shadow of doubt how important the Library is to our community. We are not there yet, though. The Town Council sent the project to the Finance Board, who must approve it, as well. 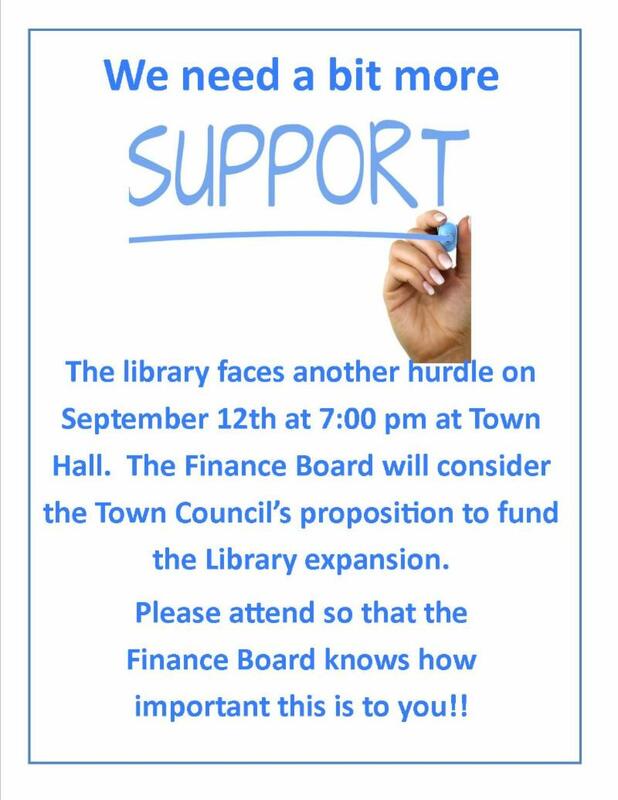 They meet on Wednesday, September 12 at 7:00 PM in the E. Paul Martin Room in Town Hall (same place as the Town Council) and we could use some support at that meeting, too. If the Finance Board approves it, they will send it back to the Town Council to set a date for either a Town Meeting or a referendum. Thanks to you, we are getting there!!! The Children’s/YA /Teen Department had a total of 66 programs during July and August. Some of these were “in house” (created and run by staff) and some were programs that were specials, mostly funded by the FRIENDS of NML. We had music, crafts, science experiments, magic, puppets, story times, reading to therapy dogs, henna tattoos, cupcake wars, tie-dyed t-shirts , lots of different animal shows and more. 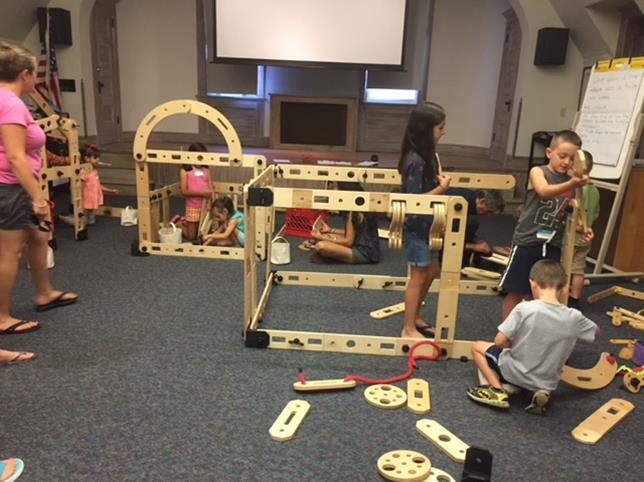 One of the new programs we had this year was “Rigamajig”, brought to us by the KidsPlay Museum in Torrington. Patty and Lou set up the room with a giant building/construction set (Rigamajig) and the kids (and their parents) had fun constructing various things. It was so cool! Another new program was “Musical Pilates”, fun and healthy exercise set to music. 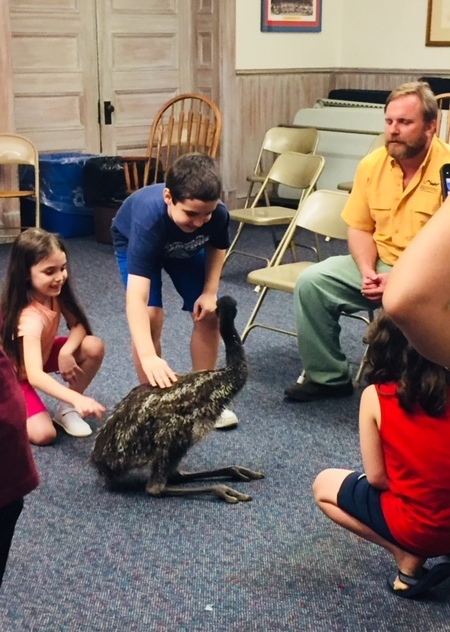 As always, the animal programs were a big hit with the families. For the first time, we had a baby emu in the library when Chris from Animal Embassy was here. That was a BIG baby bird! We learned a lot about different animals from Chris; Christine from Christine’s Critters; and Brian from Riverside Reptiles. It is wonderful that children get the chance to see and learn about such a variety of creatures in our library. Reading to Ralfy and Flash, our therapy dog friends, was an enriching and enjoyable time for many of our children. Our older kids had fun making t-shirts, painting kindness rocks, getting henna tattoos, decorating cupcakes, participating in a Monopoly tournament and Josh’s Chess Extravaganza and celebrating Harry Potter’s birthday this summer. (Many thanks to the FRIENDS for sponsoring the programs and prizes, and The Woman’s Club of Greater New Milford for their help in funding prizes for the reading programs). The Great American Read continues! Don’t forget to vote (if you have not already – the list) and enter our weekly raffle to win one of the 100 titles between July 1st and October 8th – simply read three of the titles to obtain a raffle ticket. On Wednesday, September 26th, we are proud to welcome Martha Kelly, author of Lilac Girls, to speak on one of the popular themes of fiction writing. Also remember we are hosting a panel discussion on October 3rd on the theme of ‘Who Am I?’ The panel will be comprised of local authors Nan Rossiter, Abby Ripley, and Chandra Prasad plus the winner of our writing contest. Finally, the library will host an end of program party on October 23rd where we will reveal the best-loved book of New Milford patrons and followed by the screening of the final PBS program live at 8:00 PM. Come in and pick up a brochure that gives details of all of the events or like us on Facebook. Or give us a call at 860-355-1191, x2. And don’t forget to vote for your favorite! Find out more details on our website at The Great American Read. Most of us have worked at the Library for so many years, we assume everyone knows everything about us! 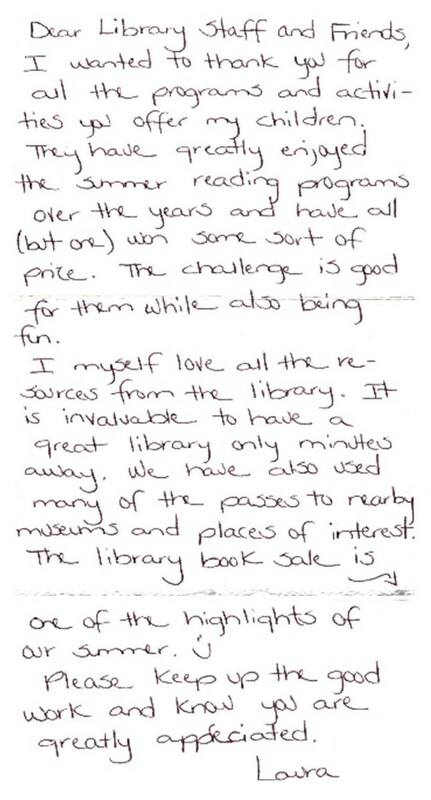 This is a handy bookmark that our Public Services Assistant made about renewing your items. Just remember this only applies to physical items – downloadables have to be renewed through the particular app. You can pick up a bookmark at the Main Desk next time you are in or just save this copy. Laura took the time to tell us how wonderful our summer programs for kids are, express her appreciation for all the FRIENDS do for us, and let us know how important we are to her family. Couldn’t resist sharing it! 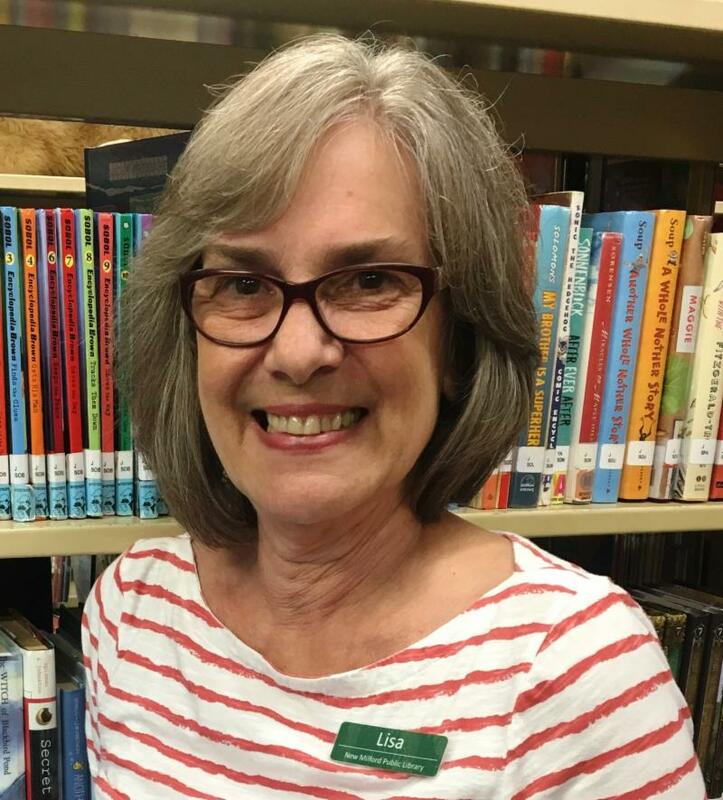 Please help us welcome the newest member of the NMPL circulation team, Lisa Peck! The oldest of three, Lisa was born in Bronxville, NY, and lived in Westchester until she was in her late 20s. Then she moved to Woodbury, CT, and at first wondered where the buses and trains were. But now after living in Woodbury for 35 years, Lisa says she would never go back to the city-like atmosphere of Westchester. Lisa worked at a few odd jobs, including as a secretary in a realty firm; then she decided to go back to school, first at Naugatuck Valley Community College (NVCC) and then at Western Connecticut State University (WCSU). She received her master’s degree in English and found a career advising adult students at Post University. After five years, she returned to WCSU to continue with this type of work. She retired after 14 years as the Associate Director of Academic Advising. She enjoyed this position very much in part because she felt she was “paying it forward.” When Lisa was younger she was in foster care, and her foster father, Ben Logan, was a writer. Lisa says he was one of the most influential people in her life and because of his (and his wife, Jacqueline’s) care and generosity, she felt she wanted to pay it forward by helping others. Ben Logan is also her favorite writer, especially his book, The Land Remembers. Lisa has a difficult time picking other favorite authors, but among her favorites are books by Alice Walker and Kristin Hannah. She has been quilting for 13 years and hopes to sell some of her creations at the art fair in November. 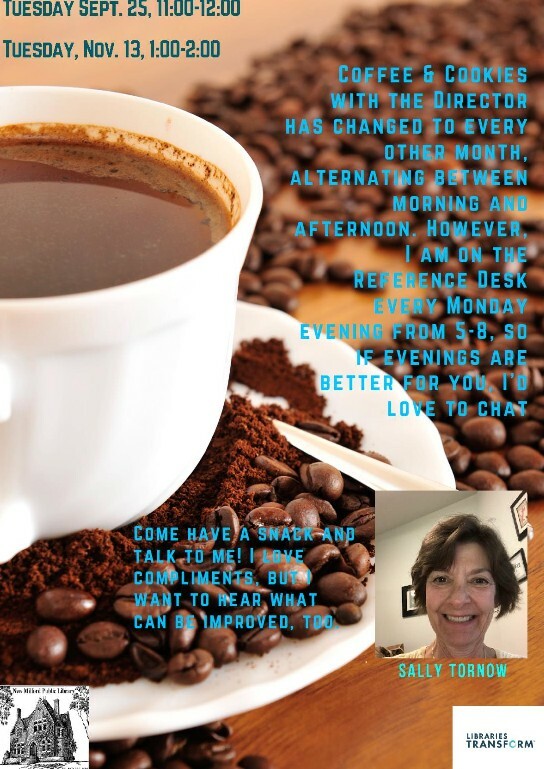 These days, Lisa is trying to live by the motto: “Live simply.” Come see her on Monday evenings and say hello to Lisa at the NMPL main desk! The FRIENDS of New Milford Library now accept contributions via PayPal. Simply visit www.friendsnmpl.org and click the Donations tab. All proceeds help provide programs and items that are not covered in the library’s budget. Thank you!